Late yesterday I walked through the kitchen garden looking for what was most ready to harvest and came away with a basket of glossy purple eggplant and matte green beans, pure colors and distinct shapes creating a still life of visual contrasts waiting for a photo but also tastes and textures ready to become a meal. 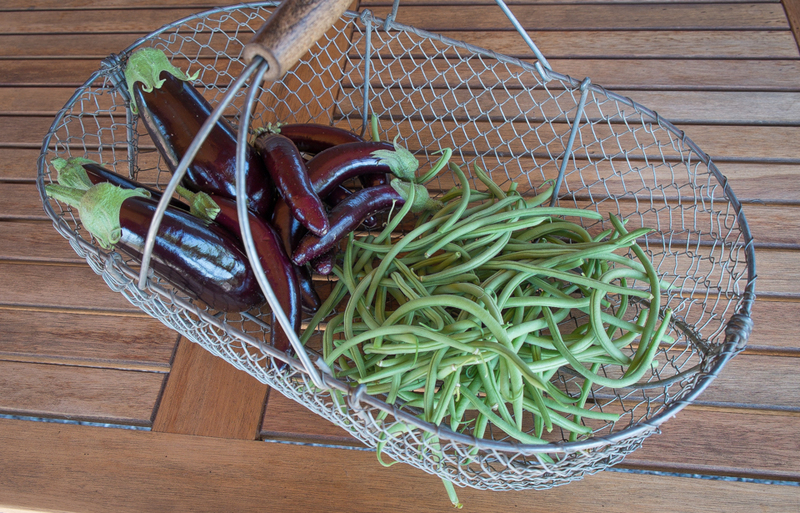 What to do with the soft, smokiness of eggplant and the crisp sweetness of green beans? Something simple that would feature each vegetable seemed best. 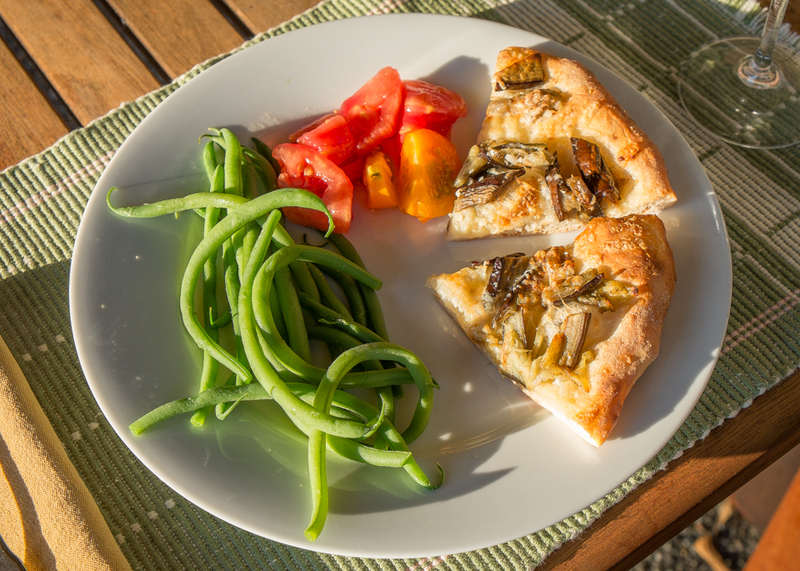 The bread oven was hot and pizza dough was rising so eggplant pizza was an easy choice and so was quickly boiled beans, both preparations that would concentrate the two flavors and look pretty too. Eggplant pizza is one of my favorite ways to eat eggplant. Crisp crust, spicy garlic and melted cheeses create the perfect setting for soft roasted eggplant. The long, slender eggplants in the basket are Hansel, a new one I’m trying this year and really like. The fuller eggplants are Galine, a favorite for the past few years. To prepare them for the pizza topping I sliced the Hansels in half lengthwise and the Galine lengthwise into half-inch slices, brushed both sides with olive oil, sprinkled them with salt and pepper and roasted them in a 400-degree oven until they softened, about ten minutes. Then I cut them into inch or so pieces. To make the pizza, I stretched out the dough, brushed it with olive oil, sprinkled the surface with about a teaspoon of chopped raw garlic, topped it with grated Trugole cheese, scattered on the eggplant bits and dusted the whole surface with grated Parmesan. In the heat of the bread oven they were done and ready to eat in about five minutes. I still swoon when I take the first bite of this pizza. The green beans are Maxibel, a bush green bean I tried this year for the first time. I always grow pole green beans, rarely bush green beans because I prefer the richer flavor of pole beans, but my friend Carol gave me some Maxibel seeds and convinced me to plant them. They are very good, not quite as richly sweet as my favorite pole bean Fortex but certainly tasty, earlier and very prolific. We’ve been eating them for the past three weeks and the Fortex are only now starting to produce. I’ll grow them next year. To prepare them, I drop the whole beans into salted boiling water and cook them, uncovered, for about four minutes, sampling them after three minutes to be sure they don’t overcook. As a side dish for the pizza, they were perfect. A little tomato added more color but really the stars were the eggplant and beans. In a large casserole dish or any baking pan with deep sides, toss the eggplant, green beans, garlic, and olive oil until everything is well coated. Sprinkle with salt and red pepper flakes, and bake for about 25-35 minutes or until the green beans are as soft as you would like them. There are some curries that use eggplant and green beans too. I’m sure they’ll be tasty but I doubt that they’ll be better than eggplant pizza with a side of green beans. 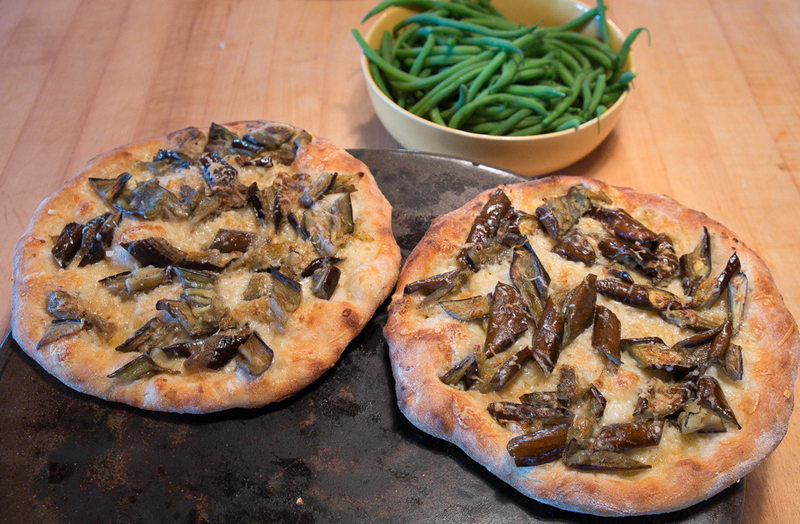 This entry was posted in Summer Vegetables and tagged Eggplant and Green Bean recipes, Eggplant Pizza, Galine Eggplant, Hansel Eggplant, Maxibel beans by Lopez Island Kitchen Gardens. Bookmark the permalink. Yum, yum! I can almost taste your delicious pizza! I’ve been gifted with beautiful beans from my neighbor and another simple preparation I enjoy is blanching them, then lightly drizzling them with toasted sesame oil and some toasted sesame seeds – very tasty too. It feels like the height of summer when your eggplants are ready. Beautiful.